Please note the game includes charts for all 6 countries, however only British and Italian piece sets are provided. Other expansion piece sets (American, German, Japanese, and Russian) are availabe for purchase separately. Engage is a WWII combat game in which the playersâ€™ are in complete control of their game, unlike other typical war games of dice and card play. You will discover that Luck is not a factor in determining your outcome. There is no luck of the dice or the need to draw the correct cards to achieve victory. Typical war games with its random chance luck factor will always ruin your well-planned strategy! Your decisions and your strategy are the only things separating victory from defeat! No more blaming the dice or cards and making your opponent feel their victory was not deserved. No game will ever play the same, as the decisions you make throughout the game will alter the direction of each game of Engage you play. 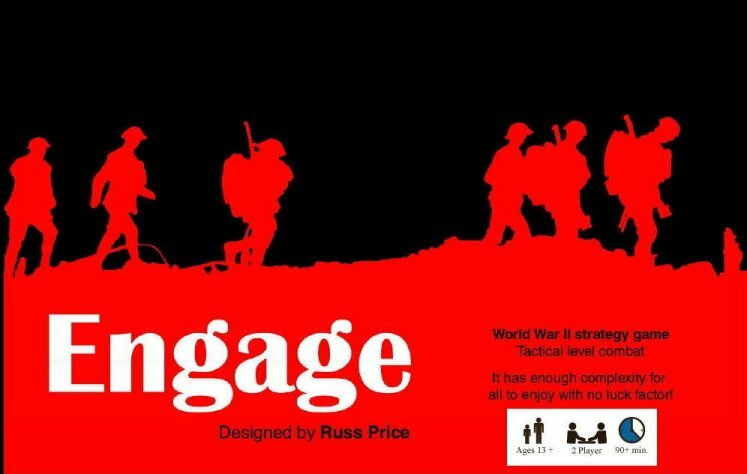 At The Engage Board Game Web Site you will be drafted in to the Engage Boot Camp, obtain Reconnaissance, locate Player Aids and attend the Engage Acadamy. The game comes with British and Italian piece sets. The game includes charts for all 6 countries though so you can purchase other Engage expansion piece sets (American, German, Japanese, and Russian) to utilize all charts.